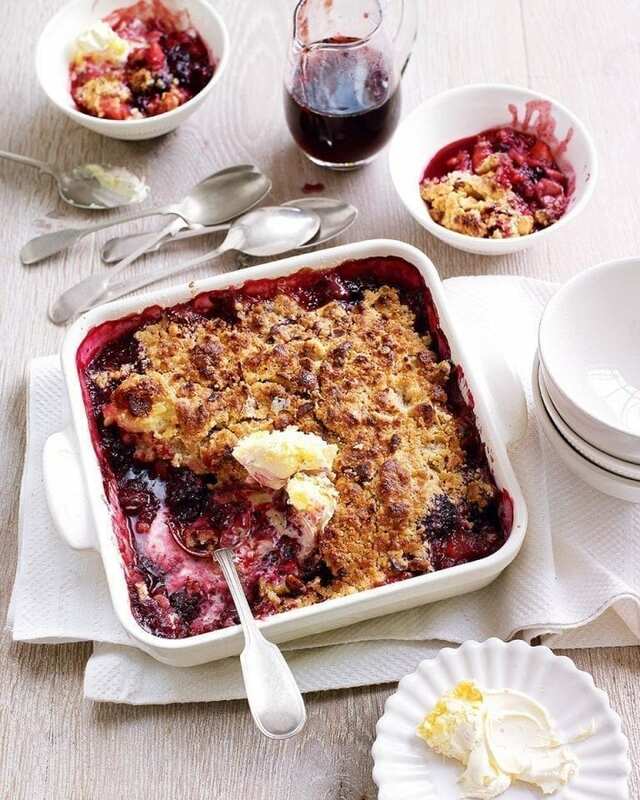 Susy Atkins’ crumble recipe uses apples, blackberries and sloe gin – a wonderful dessert to warm you up during the winter season. Heat the oven to 175°C/155°C fan/gas 3¾. To make the sloe gin syrup, pour the gin into a large, heavy-based saucepan and bring to the boil, then turn down the heat to a steady simmer. Reduce the gin by three quarters – it takes about 1 hour on a low heat. Near the end, taste for sweetness, adding a little caster sugar if needed. This makes about 200ml rich dark syrup. Put the apples in a saucepan with the 100g caster sugar and 100ml cold water. Cook over a medium-high heat for 10-15 minutes until the apples soften. They should bubble quite a lot – stir regularly to stop them sticking to the pan. When the apples are soft, add the brambles. Stir and cook just for a minute or two, then carefully transfer the mixture to a 1.2 litre pie dish and set aside. To make the crumble, heat a dry non-stick frying pan over a medium-high heat. Add the hazelnuts and toast for 2-3 minutes, turning occasionally, until golden. Leave to cool, then roughly chop. Put the flour in a mixing bowl, then add the butter in small pieces and rub into the flour with your fingertips. Mix in the sugar and nuts, again using your fingertips. Scatter the crumble over the fruit to cover, then bake for 40 minutes or until golden. Don’t worry if a little juice seeps out from under the topping. Serve with cream and the sloe gin syrup. Homemade sloe gin can be bitter so you may need to sweeten it. A cheap supermarket sloe gin is also fine. You can freeze the crumble topping and filling separately for up to 3 months; or fully prep the crumble, cover and chill for up to 48 hours.